The world's most important ore of copper for at least five thousand years. Chalcopyrite is a brass-yellow mineral with a chemical composition of CuFeS2. It occurs in most sulfide mineral deposits throughout the world and has been the most important ore of copper for thousands of years. 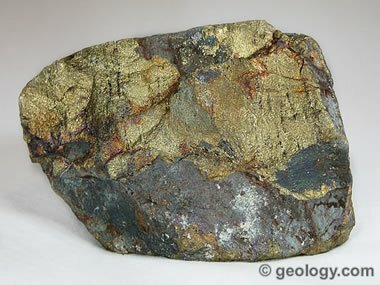 The surface of chalcopyrite loses its metallic luster and brass-yellow color upon weathering. It tarnishes to a dull, gray-green color, but in the presence of acids the tarnish can develop a red to blue to purple iridescence. The iridescent colors of weathered chalcopyrite attract attention. 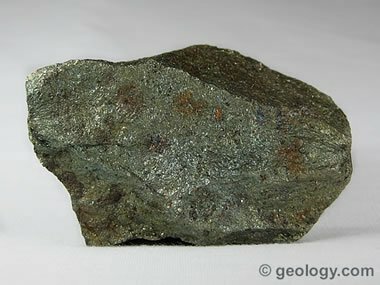 Some souvenir shops sell chalcopyrite that has been treated with acid as "peacock ore." But, "peacock ore" is a more appropriate name for the mineral bornite. Treated Chalcopyrite: These specimens of chalcopyrite were treated with acid to give them a blue and purple iridescence, which enhances their visual appeal and marketability. The most obvious physical properties of chalcopyrite are its brassy yellow color, metallic luster, and high specific gravity. These give it a similar appearance to pyrite and gold. 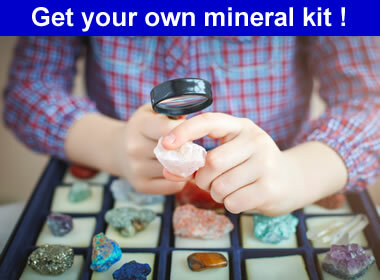 Distinguishing these minerals is easy. Gold is soft, has a yellow streak and has a much higher specific gravity. Chalcopyrite is brittle and has a greenish gray streak. Pyrite is hard enough that it cannot be scratched with a nail, but chalcopyrite is easily scratched with a nail. 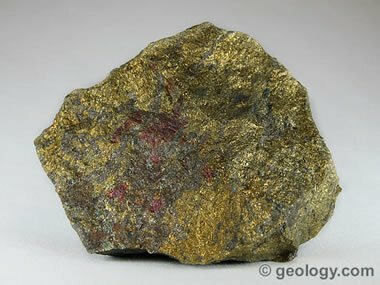 The name "fool's gold" is most often associated with pyrite because it is more common and more often confused with gold. Chalcopyrite is also confused with gold, so the name "fool's gold" is also applied and appropriate. Chalcopyrite on Dolomite: Tetragonal crystals of chalcopyrite on dolomite from Baxter Springs, Kansas. This specimen is about 10 centimeters across. Color Brass yellow. Tarnishes to gray green, sometimes iridescent. Diagnostic Properties Color, greenish streak, softer than pyrite, brittle. Chemical Composition Copper iron sulfide, CuFeS2. Uses The most important ore of copper for thousands of years. Chalcopyrite: Chalcopyrite from Ajo, Arizona. Specimen is approximately 10 centimeters across. Chalcopyrite: Specimen of chalcopyrite from Rouyn District, Quebec, Canada. Specimen is approximately 10 centimeters across. 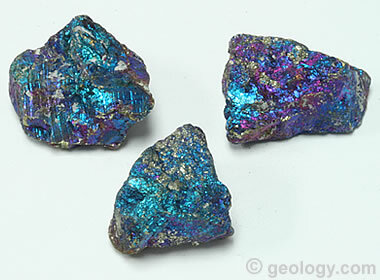 Chalcopyrite forms under a variety of conditions. Some is primary, crystallizing from melts as accessory minerals in igneous rocks. Some forms by magmatic segregation and is in the stratified rocks of a magma chamber. Some occurs in pegmatite dikes and contact metamorphic rocks. Some is disseminated through schist and gneiss. Many volcanogenic massive sulfide deposits containing chalcopyrite are known. The most significant chalcopyrite deposits to be mined are hydrothermal in origin. In these, some chalcopyrite occurs in veins and some replaces country rock. Associated ore minerals include pyrite, sphalerite, bornite, galena, and chalcocite. Chalcopyrite serves as the copper source for many secondary mineral deposits. 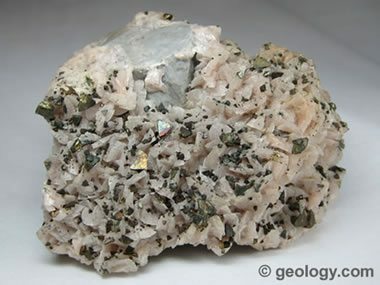 Copper is removed from chalcopyrite by weathering or solution, transported a short distance, then redeposited as secondary sulfide, oxide, or carbonate minerals. Many malachite, azurite, covellite, chalcocite, and cuprite deposits contain this secondary copper. The only important use of chalcopyrite is as an ore of copper, but this single use should not be understated. Chalcopyrite has been the primary ore of copper since smelting began over five thousand years ago. Some chalcopyrite ores contain significant amounts of zinc substituting for iron. Others contain enough silver or gold that the precious metal content more than pays the costs of mining.